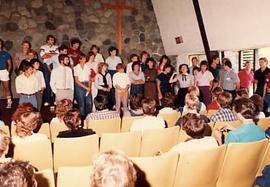 Photograph of a female student singing with the choir in the chapel. Photograph of the members of the choir posing together and uniformly dressed at the front of the Calvin B. Hanson Chapel; Director David Rushton is in the centre. 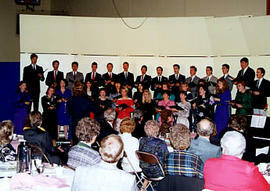 Photograph of the members of the choir singing together uniformly dressed in the Calvin B. Hanson Chapel, led by Benno Friesen; Marge Friesen is at the piano.